Several local defence positions and machine guns. Two casemates facing in opposite directions with several defence positions around the curtain wall of the old Victorian fort. A searchlight set into a Victorian Caponier, one Flak gun on the roof and I would think they used the old barracks as their barracks as there were probably 60men in the fort. Alderney, Wn Eilandfeste, Fort Raz view. The view down to the fort with Longis Bay and the anti-tank wall running nearly all the way along it. Completed in 1855 there were ten guns in two batteries facing out to sea. The complement was two officers and 64 men. There was a draw bridge to close off the entrance and the tide covers the causeway twice a day. 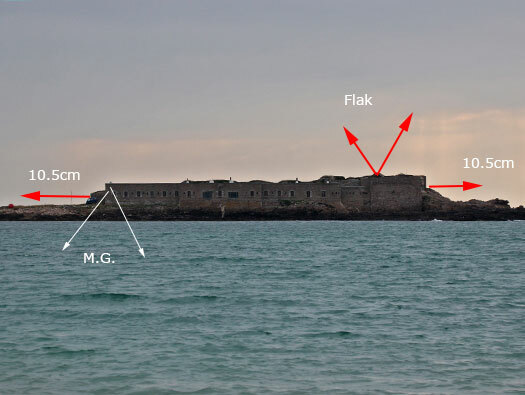 Alderney, Wn Eilandfeste, Fort Raz fire plan. Showing the weapons positions on this side. 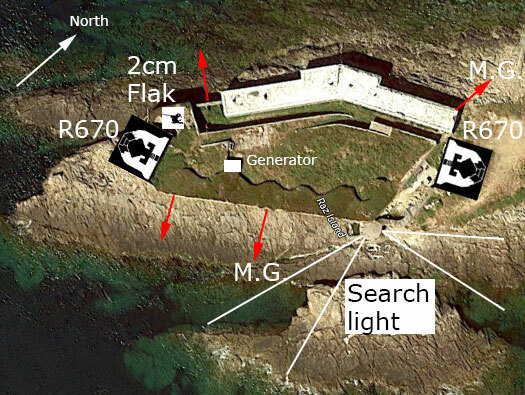 Alderney, Wn Eilandfeste, Fort Raz R670 casemate. R670 casemate for a 10.5cm K331(f) pivot mounted gun. 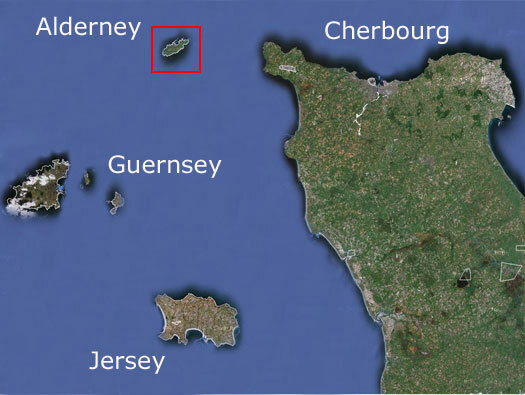 Alderney, Wn Eilandfeste, Fort Raz Barracks. This may have been where they had to live and sleep. This end also has an R670 casemate. 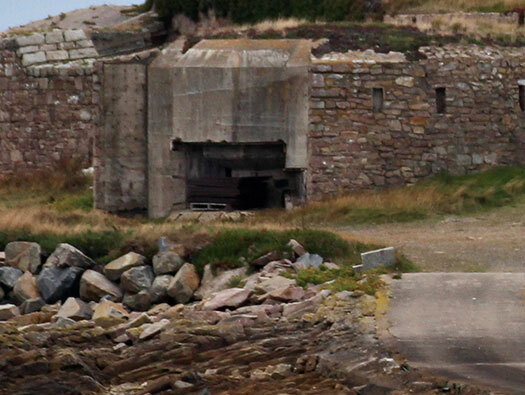 R670 casemate just poking through the forts wall..
How the gun would have looked. Inside with ammunition stacked up on the side. The road way to Fort Raz and when the German anti-tank wall was added a double set of steel gates. Sherman tank that never landed. 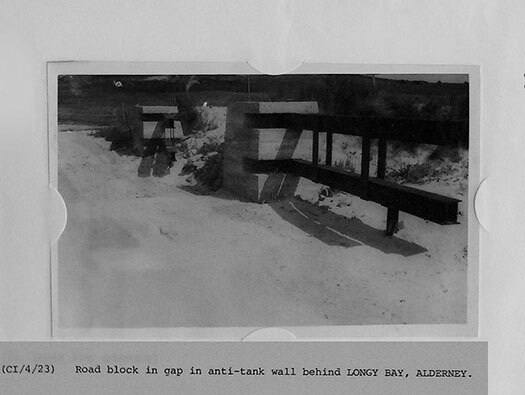 Photo taken in 1945 of the anti-tank gates. 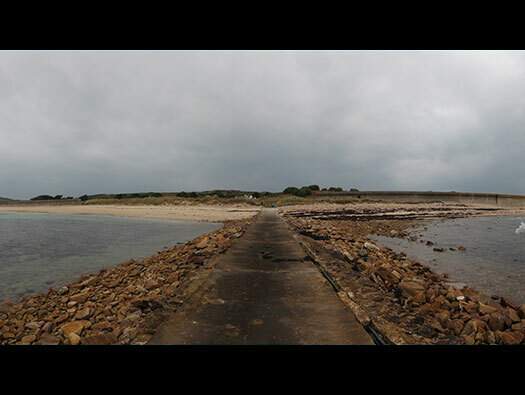 The causeway looking back towards the anti-tank wall. Tide was coming in so we did not make to the island.